It’s no secret that in America, the needy outnumber the privileged by a long shot. A startling new statistic, however, makes it clear that the inequality in our country is somehow even worse than originally thought: Apparently, fewer than 1 percent of all Americans have access to fun New Orleans-style jazz funerals when they die. Yikes…talk about a wake-up call. According to a recent study published by Cornell University’s Center for the Study of Inequality, over 99 percent of U.S. citizens will never have jazz funerals featuring a full brass ensemble that follows their casket when they die. 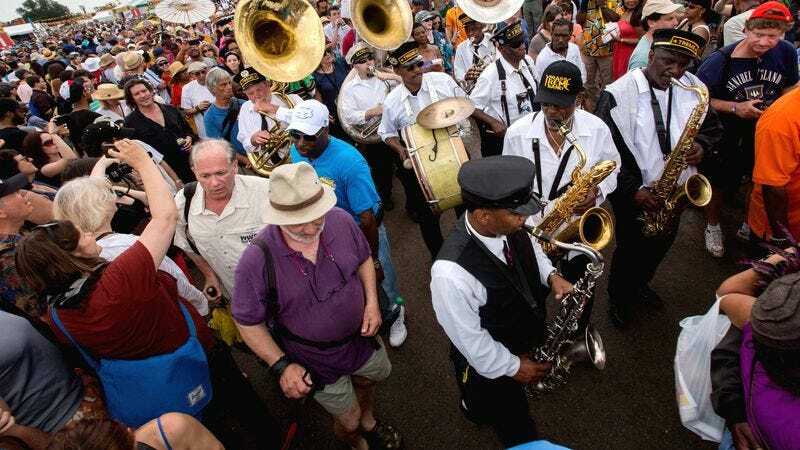 As of today, these special processions, which feature upbeat tuba dirges and marches through the Big Easy, are only enjoyed by a select few, while the rest of the country is relegated to somber services with hymns sung by old women in old, dark churches. Sadly, polls show that funerals featuring lavish, beignet-fueled swing dance lines down Bourbon Street remain firmly out of reach of everyday Americans. In reality, the majority of the population has already resigned themselves to a quiet service and wake after death, and would never even dream of celebrating with pastel sun umbrellas, whistles, and or an infectious drum line that inspires onlookers to dance along. If there’s ever been a sign of our country being divided, it’s definitely this. Wow. After hearing statistics like these, it’s hard not to dream of a perfect world, where no one would have to wear black to funerals, or stare silently at an open casket. Because honestly, every American deserves to have a funeral filled with improvising trombones and creole flare—no matter who they are or where they’re from.